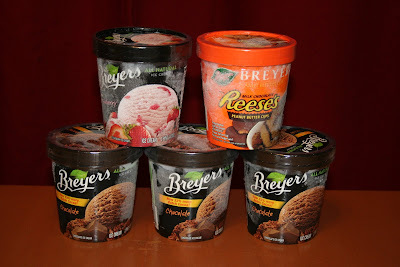 More Cheap Breyers Ice Cream! So it would appear, upon thinking it through a little more, that the deal I had posted earlier was perhaps not in compliance with coupon rules. Since the $4/5 catalina is, in fact, a manufacturer coupon, then stacking a regular manufacturer coupon with it could cause the store to not be reimbursed. Of course I don’t want that to happen as we want stores to become more coupon friendly, not vice versa, so I have updated the post accordingly. Thanks to all who commented in with their concerns as it hadn’t crossed my mind that I was promoting something less than ethical. Everyone probably has their freezers stocked with ice cream products from all the great deals this month, but just in case you want more, here is another great deal at Albertsons. $.50 each — Using the 3 Albies double you could end up with 6 pints for $3. BTW: I read the fine print on the catalina and it does say, “Excludes single serve items” on it so I checked the servings on the pints of Breyers and they are 4 servings per container. no wonder I was up posting at 1am…..
Great tip, thanks! Can you tell us the details so everyone knows what to look for? I just used my catalina at Walmart to get free fudgecicles and popcicles. And their Klondike bars are 2.50 each – if you don't have a fridge full like I do! I'm going to give this a try this evening. I'll keep you posted. THANKS for the suggestions!! Oh wait, actually I think you can buy 4 to get the catalina to print, so the price would be $6 minus $4 in coupons = $2 OOP to get the $4 catalina. Anon, you don't have to pay full price on the initial purchase if you have coupons. You can buy 5, which would be $7.50. Then use (2) of the $1/2 IP coupons with (2) doubles to get $4 off. So, you pay $3.50 OOP and the $4 catalina will print. I used the IPs last night to purchase ice cream (3 IP on 6 ice creams) and the catalina printed. Looking at the catalina, it is clearly a manufacturer's coupon, just like one from the newspaper and specifies that it is valid when five products are bought…to combine with the internet coupons seems sketchy to me, using two mc on one product which the coupons state is not allowed. I don't know that the manufacturer would reimburse for that or that it fits within the terms of both coupons. Obviously everyone needs to make their own determination about what they are comfortable with. I know no one would intentionally cheat the companies. So I must purchase the products at "regular price" first to obtain the catalina, and then I can use that coupon to buy add'l? That's not really what I wanted to do. Any other hints? Anonymous–The Breyers catalina seems to print every time you buy at least 4 breyers, popsicle, klondike or good humor products. Last week it printed when I bought popsicles and the week before everytime I bought at least 4 breyers ice cream in one transaction it printed one $4/5. How do I get the Breyers catalina? I purchased some tuna in an attempt to obtain it, but no catalina was generated, and the gal told me it was completely random. This was at the Milwaukie Alb. I thought about this earlier, I do have that catalina but since it's a manuf coupon technically on 5 items I didn't think I could use extra coupons. The $4/5 should be just like any of their catalinas which are also manufacturer coupons. I was able to do this very deal and the register didn't beep at all. It could depend on the store though, and then if it does beep it would probably be up to the cashier. I'm surprised it didn't work for you a couple weeks ago, unless you were using two $1/2 IP's, as that would have given you overage. They could have done one though. The albies doubles are on the inside flap of the Wednesday Albies ad, you can usually find them at the customer service desk, go sooner rather than later though. Where did you find the Albies doubles? I was wondering the same thing, wouldnt you be using 2 mc's on one of them. Did you get any beeps when you did this? If not I'm totally going to do this. I'm almost out of th 9 free ones from the last sale. It was 108 degrees here in Oly, Wa yesturday. Other than Walgreens, I mean. Sorry for the thre comments; I just took some free NoDoz from Rite Aid and I'm hyper now, LOL. Can you do that anywhere? So we can use combine the cat with IPs even though the cat says it's a manufacturer coupon? I had no idea.